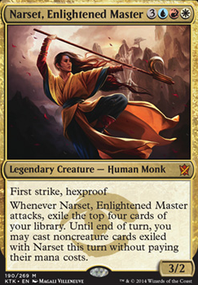 Another Narset question! This time with enchantments. Combat damage replacement effects interactions! Can this prevent me from sacrifice? 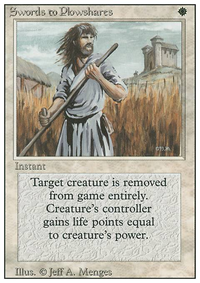 (0): Remove target attacking creature you control from combat and untap it. 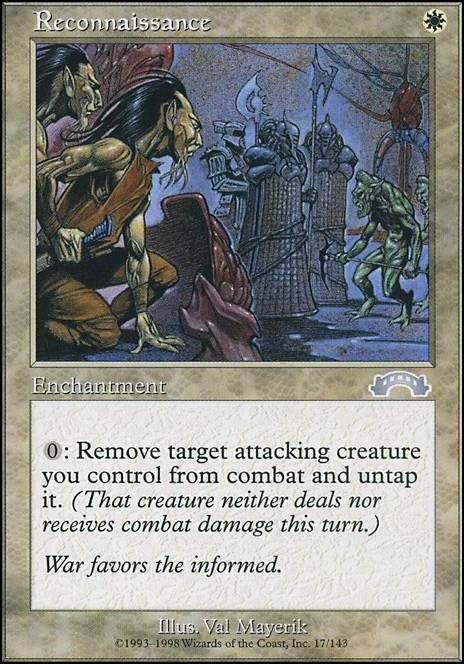 Prevent all combat damage that would be dealt to and dealt by that creature this turn. Avacyn, Angel of Hope , Frontline Medic , Selfless Spirit and Reconnaissance are some interesting options. 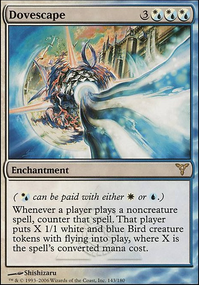 I also recommend some cards like Quicksilver Amulet since alot of the beaters are pretty costly. Last_Laugh thank you so much for commenting! Reconnaissance is used in our meta by a Varina, Lich Queen deck. I'm wondering, why I never thought about it. Thank you a lot, for the mentioning aswell as for the explonation! Some of the other cards you mentioned are already included in my list: Shared Animosity , Skullclamp , Herald's Horn and Twilight Prophet . I like the mentioned Sorin, Solemn Visitor aswell, but didn't figure out till now, which card I could take out in order to include him. Dark Prophecy and Greed are kind of on my radar, but the first one can be really dangerous and for the second one it's the known problem. I don't know which card to cut. Maybe Outpost Siege ? I agree with the instant speed, but with Reconnaissance you can actually remove the creature after they have dealt damage, so it is kind of like vigilance (learned that from the game knights with prof. and wedge). Great Deck +1! I would like to suggest Reconnaissance as a second and better version of Vanishing . Run Reconnaissance (avail. in German lol). 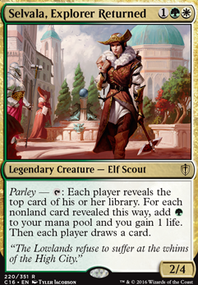 This card allows you to attack with everyone safely (yes, even that 0/1, why not), untap each creature at the most opportune time for pseudo vigilance, and still deal combat damage in most situations. Untaps to avoid bad blockers (obvious face value of the card), it untaps after first strike damage but before normal combat damage is dealt (great for getting +1+1 counters from Drana, Liberator of Malakir to your whole team and busted with Stromkirk Captain ), and it even untaps after normal combat damage is dealt due to the creature being an 'attacking' creature until the end of combat step ends (you untap in the middle of this step). Shared Animosity (also German) also 100% deserves a spot here. This combination of full tilt aggro with everyone available to block makes Sorin, Solemn Visitor 's +1 really good here (Note, 'until your next turn') and it more than offsets a few of my next suggestions. As far as the decks inherent card draw weakness goes, add Skullclamp , then consider Dark Prophecy , Greed , Herald's Horn , and Twilight Prophet . Run Reconnaissance . 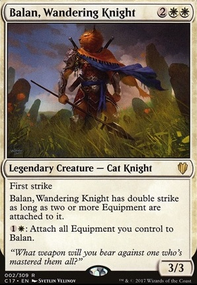 This card allows you to attack with everyone safely (yes, even that 0/1, why not), untap each creature at the most opportune time for pseudo vigilance, and still deal combat damage in most situations. Untaps to avoid bad blockers (obvious face value of the card), it untaps after first strike damage but before normal combat damage is dealt (great for getting +1+1 counters from Drana, Liberator of Malakir to your whole team and busted with Stromkirk Captain ), and it even untaps after normal combat damage is dealt due to the creature being an 'attacking' creature until the end of combat step ends (you untap in the middle of this step). 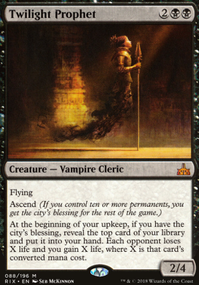 As far as the decks inherent card draw weakness goes, consider Dark Prophecy , Greed , Necropotence , Herald's Horn , and Twilight Prophet . 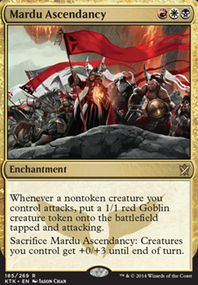 Protecting your board also prevents topdeck mode, consider Boros Charm .